Whilst building your home you may have decided to follow the eco friendly route and produced a home that has used not only materials that are good for the environment but installed products to further improve your carbon footprint. Another way to continue with your plans for your home to be green is to use eco friendly products when finishing your home. It is becoming increasingly easy to purchase decorating materials for the home. Most major retailers now stock products that will not harm our environment and they should not cost any more than similar non green products. 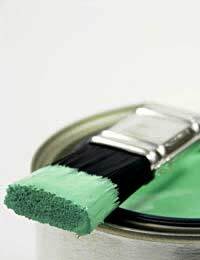 Many paints will be 100% biodegradable, this does not mean that it will rot on your walls but the product will be easily disposed of on a compost heap. Paints are available for interior and exterior use in most popular colours and finished. When you think that most products manufactured in the past could affect our planet for hundreds, if not thousands of years to come it is a comfort to know that by using eco friendly decorating materials we are making a smaller impact on our planet. It is rather frightening to know that many textured products that we splashed onto our walls in the past could have contained harmful asbestos particles. To stop this dust entering our lungs and the environment when we attempt to remove it there are now products that can be painted over the coating that will stop the dust causing further danger to our lungs and the environment. If you are contemplating laying a timber flooring be sure to purchase hard wood that comes from sustainably managed forests. Do not take the sales persons word that the flooring you buy comes from sustainable sources check with the manufacturer if the product isn't marked. When staining or sealing your wood floor remember to use a natural product. If laying carpet go for the natural fibre such as jute, or hemp. Wool and untreated cotton also make ideal rugs and throws for the home. If you intend to buy new furniture for the home avoid anything made from medium density fibreboard (MDF) or any other particle board products as they are often made with harmful glues. Instead consider recycling older furniture by stripping or sanding the surface and staining or painting with new eco friendly products. Curtains and curtain fabric can now be purchased with linings that will help retain heat into the home. Purchase curtains made from organic cotton rather than man-made fabrics or cotton plants sprayed with carcinogenic sprays. Energy efficient light bulbs are now readily available in every high street store. There is no excuse to not replace every light fitting in the home with these eco friendly fittings. When landscaping your garden think of the wildlife and don't remove all trees and hedgerow. Try not to cover too much of your land with concrete paving as it affects the lands ability to soak away surface water and in times of heavy rain fall your home could flood. Install bird boxes and bat boxes to encourage wildlife into the garden along with plants and shrubs that will encourage butterflies and bees. A pond will quickly attract wild life to the garden and provide an attractive natural feature.